How Looming Quantitative Easing 3 Portends Gold Investment Rush! Even the $100 shows that it pays to be made of gold. First implemented by Japan in 2001, Quantitative Easing is widely regarded as a highly unconventional means of controlling an economy. When interest rates have reached a point so low that further reduction in its rate will yield practically no further improvements for an economy, a government will typically purchase deep into a particular asset group – like stocks, bonds or derivatives – in order to inject cash into the overall economy. It is assumed that such low interest rates will lead to ever decreasing prices for consumers of all types, thus creating the condition for “deflation.” The risk with Quantitative Easing, however, is known to be the creation of unbounded inflation, which quickly devalues cash portfolios. (1) What’s an investor to do in this situation? With investment firms and groups in Europe calling for European-style Quantitative Easing since the week of January 9th, those of us on the other side of the pond are genuinely confused by the thought of pumping more cash into the markets ostensibly through the wrong hands. If you are in the mood for (or by now in dire need of) a chuckle, this 2010 XtraNormal video does a solid job expressing the fears and concerns of “Main Street” America when it comes to the practice of Quantitative Easing. Which will it be: deflation or inflation? Best to hedge your bets. 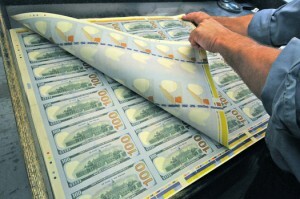 QE3: Taking Control or Burning Down the House? Whether the projected $500 billion(2) infusion works or not is largely dependent on personal beliefs about the veracity and strength of paper money. In this day and age, it may not be too large of a stretch to think about fiat money and papered investment portfolios as group hallucinations. The myth is that these moves will grant us a bit of control over a collapse or a sudden uptick in the economy. The fear is that this injection will eat “real” cash like a forest fire hopping from tree to tree. The currency markets have been awaiting the backstop of QE3, but had to hold out for the replacement of the EU’s Chief Financial Officer, Jean-Claude Trichet. With his new MIT-trained replacement, Mario Draghi, now securely ensconced, we can ready ourselves for Bernake-like action out of the EU. The Easing, it doth cometh. This presents a solid opportunity to buy gold. Deflation has not yet officially arrived and inflation is mostly isolated as a social experience for those who cannot buy in bulk or in advance. On January 23, gold closed at $1,676.30. An unexpected six-week high, the volatility in the market is likely a reflection of cash outs by those attempting to cover their burning paper assets and the traditional bump provided by buyers in China as part of Lunar New Year preparations. (3) Rather than wait to back fill smoking holes in your portfolio, diversifying your holdings with tangible investment instruments like gold is a good start to protecting the history of a brighter future.